Ireland is known as “The Land of The Horse”. A temperate climate and good soil conditions make it an ideal place to raise horses. An ability to cross any country has ensured that the Irish Horse is surefooted and looks after it’s rider. The Irish people have a natural affinity with the horse and this is evident in the horses they have. The Clew Bay Trail ride takes small groups of experienced riders along Ireland’s Wild Atlantic Way through new and ever-changing landscapes of small villages, breathtaking sandy beaches, sea and off-shore islands, country lanes, mountain tracks and local heritage sites, stopping for a picnic along the way. 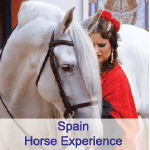 ”Your host is a Qualified Riding Instructor, a Monty Robert’s Certified Instructor and an accomplished Irish horseman whose family have been involved with horses in the locality for generations. The majority of the trail horses have competition experience and have been trained by the family. 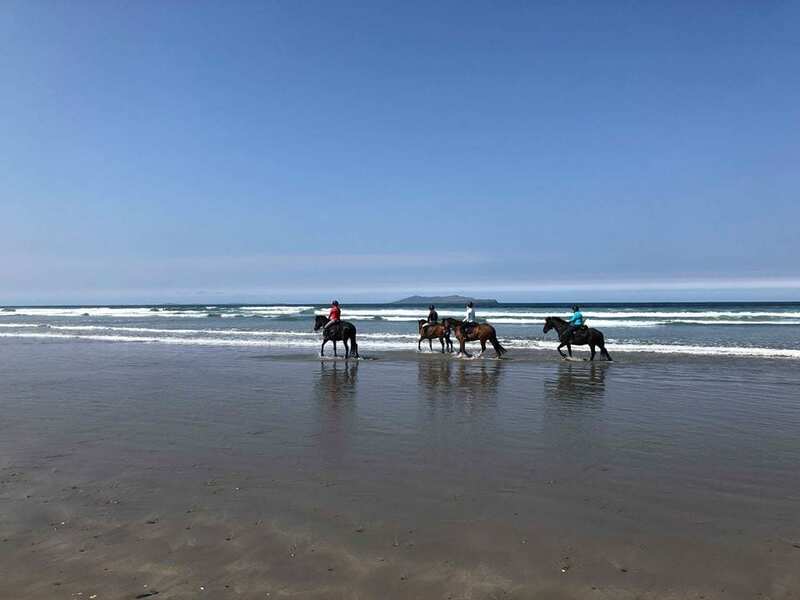 This combined with the spectacular Clew Bay region, quality Irish horses and excellent accommodation ensures this is a horse riding adventure holiday you will cherish forever. You need not be an expert to ride the trail as you are well taken care to ensure that each rider is matched with a suitable horse, however you should be able to ride securely and confidently at a walk, trot and canter in open country. You must be secure in the saddle and be comfortable riding for four hours plus a day. Rider weight limit: 200lbs/ 90 kilos. The preferred level of riding is intermediate and above. Riders should be reasonably fit and we suggest you go riding a couple of times a week before coming on our trail. ​This is a progressive ride with the pace varying from slow to fast depending on terrain and weather conditions. The tack used is English. The horses breeds are Connemara Ponies, Irish Sport Horses, Irish Draughts or Irish Cobs. The size varies from 13.2hh to 16.2hh. 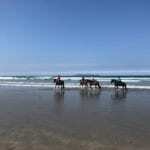 ​All the horses have good temperaments and stamina make our horses ideal for the trail. We normally have at least 10 horses available for the trail. ​​The group size is a minimum 2 to 8 people. There is a guide for up to 4 riders and two guides for more than 4 riders. Children 12 years and over are welcome if accompanied by an adult. Helmets are strongly recommended and are available if you do not bring your own. Boots with a heel must be worn to comply with insurance regulations and a packing list will be provided after you book the ride. All the rides start on a Sunday and finish on a Saturday. The ride includes visits to historical sights, rides along country lanes with stone walls, riding on the beaches of the Atlantic way as well as visiting quaint Irish villages. Today is arrival day. On arrival to Westport, check in to your accommodation which is where you will be staying for the trail. After breakfast Transfer to Drummindoo Stud to meet your host, your horse and the other riders. After an assessment ride in the indoor arena, riders and horses are transferred to the village of Aughagower for the Aughagower Ride. This takes us through the village of Curvey, along the shores of Knappagh Lake, through the village of Mountbrown and returning to Aughagower via an old shepherd’s track. After riding there is a chance for riders to visit the round tower and monastic site which dates back to the 7th century. Transfer to Cloona just outside of Westport. Today we take the Skelp Ride towards the east side of Croagh Patrick (Ireland’s Holy Mountain) and then on to Teevnacroagha to ride in the footsteps of Saint Patrick to the foot of the mountain which has been a site of worship for over 3,000 years. We cross the Owenwee river and on to the peat bog tracks at Owenwee to see the bog oak and how the peat is harvested before finishing the day at Cloona. Transfer to the village of Bouris for the Laghta Ride. This ride takes us to the west of Croagh Patrick, high up in the hills to Laghta beside deserted homesteads. We cross the Bunowen River and enjoy panoramic views of Louisburgh and the Atlantic Ocean on our descent. There is evidence in the landscape of the Lazy Beds (dating back to the Great Famine) where people used to grow potatoes. We then ride along some bog roads and finish the day on our return to Bouris. We pick up the trail again at Formoyle (our base for the next two days) for the Feenone Ride. This takes us over a mountain pass, close to a megalithic burial site (one of many in the area), through the Carrowniskey River and on to the bog roads at Feenone. Clare Island (Grainne Uaile, Ireland’s famous Pirate Queen resided there in the 1500,s and controlled all the waters of Clew Bay) can clearly be seen. We then head for Doughmakeon Strand where we can canter and gallop before returning to base. Depart after breakfast with fond memories of your equestrian adventure. You may like to enjoy further sightseeing in Ireland which we are more than happy to help with. ​Note : The Itinerary may change slightly due to circumstances beyond our control such as bad weather, tidal variations etc. and we reserve the right to change this without prior notice. You will stay in locally run guest house accommodation for the trail. The guest houses have been carefully chosen and located either in or close to Westport Town. The accommodation is approved by the Irish Tourist Board and all provide a quality personal service. The bedrooms, which are en-suite are both comfortable and relaxing. Full Irish or continental breakfast is available and special dietary requirements are catered for. As the accommodation is on a bed and breakfast basis this gives you the opportunity to choose from the many fine, award winning restaurants in Westport for your evening meal. The rates are based on the Euro and subject to currency fluctuation. We use the ANZ sell rate to convert from euro to the Australian dollar. So please contact us for the most up to date pricing for your riding holiday. Six nights Bed and Breakfast guest house accommodation in twin or double share rooms. Single rooms available for a supplement. Breakfast daily and picnic lunches. One riding guide for up to 4 riders and two guides for more than four riders. During the ride you will enjoy sightseeing in the local area including visits to historical sights, beach rides and through many Irish villages. This ride is suitable for non-riders. While riders are on horseback, although there are no separate activities planned for non-riders, they can enjoy the accommodations and region independently. Dublin is the closest international Airport and Knock is the closest airport and Aer Lingus, Ryanair and Flybe fly from the UK to Knock. If you are travelling from Dublin it is recommended to take the train from Dublin (Heuston station) direct to Westport. Hiring a car is another alternative which is a 3.5 hour drive from Dublin. Transfers can be arranged and please contact us for further details.